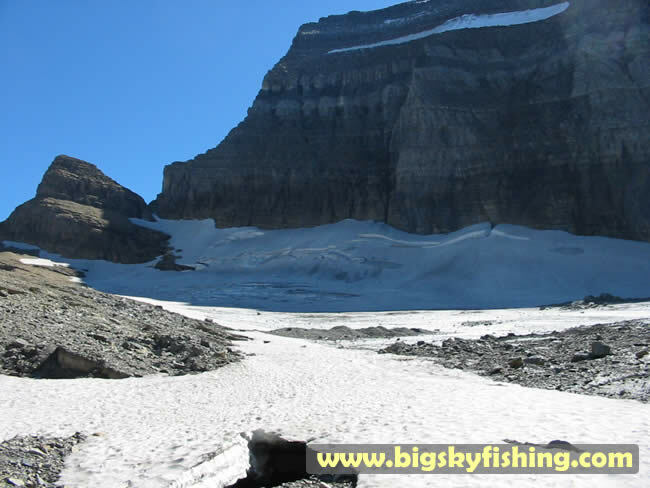 This picture was taken near the melting end of the Grinnell Glacier, and looks up towards the top of it. The mountain behind the glacier is Mt. Gould - which provides the needed shade to allow the glacier to form and also works as a windbreak - allowing the snow during the winter months to pile up the snow down in the basin. Unfortunately, the warming climate is taking over. It is estimated that within the next 50 years the Grinnell Glacier is likely to be nothing more than a semi-permanent snowfield.